The Acropora corals are elegant reef-building corals, which inhabit most of the world's reefs! What Do Acropora Corals Look Like? The Acropora corals, along with the Montipora corals, represent one third of all the 'reef building' corals. Their light skeletons, high metabolism, and specialized 'axial' corallites result in fast growth, allowing them to quickly overcome their neighbors. The genus Acropora has close to 400 nominal species with nearly half that many described. The majority of these corals are found in Pacific reefs, but 3 species are found in the Atlantic. The most common name for Acropora corals is the popular "staghorn coral". This is a branching form that fits many of the acropora species. For instance, the coral above A. formosa is a branching coral. There are many other forms that Acroporas take as well. Other forms are shaped like tables, plates, columns, ridges, bushes, fingers, or clustering corals. The table or tabletop Acroporas are some of the most elegant and sought after forms for very large aquariums. Yet they are also some of the most difficult Acroporas to keep. Acropora Coral Facts Acropora are from the Subclass Zoantharia and the Order Scleractinia. The family Acroporidae was erected by Verrill in 1902. The scientific name Acropora spp. is credited to Oken in 1815. Another name these corals are known for is Arborescent Acropora. Acropora inhabit most of the world's reefs, almost all are in Pacific reefs with just 3 species found in the Atlantic. They are found in upper reef slopes, where the current is very strong. Some species are also found in deep water, lagoons, and silted water as. Acropora corals are the largest, most contributing coral for reef formations in the world. In fact, between the Acropora and Montipora corals, they make up one-third of all reef building coral species. In the wild they are the most tolerant of water temperatures, salinity changes, water movement, and lighting, but in captivity they can prove to be very difficult to keep. In the ocean, they are the first to arrive at a reef and spread quickly. Other corals that arrive later, then tend to move in. Acropora species have been propagated in captivity, thus helping to conserve wild populations in the world's reefs. Some of their growth forms have been included in common names such as staghorn coral, cat's paw coral, bottlebrush coral, table coral, tabletop coral, and plate coral. Buying captive propagated Acropora Sp. also helps the aquarist. They are a little more hardy than their wild siblings, but they can still succumb to diseases typical to Acros. The polyps of most Acropora are small, so aquarists refer to them as small polyp stony corals, or SPS corals. What Do Acropora Corals Look Like? Acropora corals have an enormous range of sizes, shapes, and colors. Other physical characteristics include the size and shape of the branches, the size and shape of the tips, the positions and number of secondary branches, and several other factors. The shape of the Acropora depends on the location where they are found in the ocean. For instance, corals of a species located in turbid water will be very thick, while that same species can be long and thin if found in deeper waters with less water flow. Acros have very porous and lightweight skeletal structures. The characteristics of size, form, and color result from their polyps. The polyps at the tips of branching species constantly secrete corallites, forming new growth. They have both axial and radial polyps for budding new corallites. Acropora spp. corals are characterized by their fast growing terminal (or axial) polyps. These terminal polyps do not have zooxanthellae. They grow quickly because the terminal polyps are fed by the rest of the colony. This allows Acropora to outgrow other corals on the reef. .Acroporas are one of the fastest growing corals. The polyps of most Acropora are small, so aquarists refer to them as small polyp stony corals, or SPS corals. Acropora species in general, reach sexual maturity within 3 to 5 years, with a branch diameter of 1.5 - 2.75" (4 - 7 cm). Most Acroporas grow up to 20 inches (51 cm), but depending on the species some Acropora corals can get up to 10 feet. They live 4 to 7 years. Acropora corals can be found in just about every imaginable color. 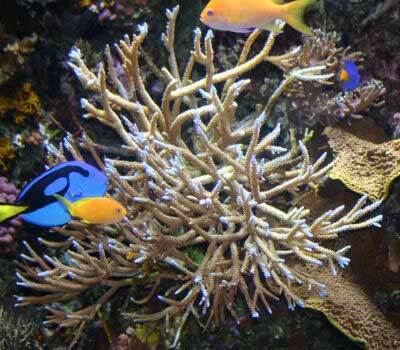 The color of their branches comes from the marine algae, zooxanthellae, which reside within the radial polyp tissues. Zooxanthellae have a range of pigments, including fluorescing pigments. Radial polyps bud off in regular fashion yet can take a variety of shapes including scale-like, rasp-like, immersed or appressed, pocket-like, and rosette forming. The tips of fast growing branches are usually pale, as they have not yet become saturated with zooxanthellae. Acropora comes in all kinds of colors but can change dramatically depending on the environment. A green coral at the dealer may well turn out brown after it has been acclimated to your aquarium. And vice versa, a brown coral may turn out green after bringing it home! Brown Acroporas are said to do better than the colored variety. The axial corallite is a more recent evolution within these corals that allows for very rapid growth. These polyps keep the colony closely interconnected with coordinated growth, they are fed by the rest of the colony which provides fast growth, and they allow species to form the most advantageous shapes. The axial corallites themselves are tubular in shape. These polyps don't contain zooxanthellae, so do not contribute to the color. Staghorn or Branching corals: The Staghorn acropora have distinct branches that look like antlers. Acroporas with thick branches are said to be harder to keep than ones with thin branches. Table or Tabletop Corals: Table acropora have short branches that reach upward to form a flat table-like structure. The surface of the table is perfectly flat in nature, so when placing it in the aquarium, make sure it is as flat as you can get it. Some grow so fast, they can easily end up shading corals below them. Column and Plate Corals: These acroporas are formed like columns or plates, usually with 'bumps' rather than branches extending outward. Finger corals: Finger acroporas have digitate, or finger type branches. Bushy Corals: Bushy corals have many tightly compacted branches and look bushy. Cluster corals: Clustering acropora grows in various sized clusters that resemble cauliflower and is sometimes bumpy. Bottlebrush corals: Bottlebrush acroporas have short side branches. Keeping Acropora Corals Beautiful home reefs can be either a simple reef with hardier, less demanding animals, or a more complex reef with higher maintenance specimens. Stony corals are more demanding and take a more dedicated effort. So keeping stony corals is itself a step beyond a simple or beginner reef. Having reef-keeping experience is invaluable to successfully keeping hard corals. With some of the less demanding inhabitants you can hone your skills. With the desire to learn specific husbandry techniques and the willingness to purchase the proper equipment, anyone can keep a gorgeous reef aquarium. Of course the aquarist must invest his or her time in the care of these unique animals as well. Due to the more stringent requirements, keeping Acropora corals is not recommended for beginners. They are the most sensitive corals when it comes to temperature changes; and they stress very easily if the light is too low, or the water movement is not sufficient. Even moving them around the tank can cause them to stress and die.The Acropora coral likes medium to strong water movement, and prefers a turbulent flow. It requires strong light from VHO or metal halide. They are not hard to keep as long as these requirements are met along with maintenance of calcium, strontium and trace elements. It takes about 5 to 6 months for Acropora species to regain their normal growth rates after being added to an aquarium. At times a healthy system has an additional Acro added and all the others die from polyp bail out or what people refer to as RTD (rapid tissue degeneration) and a whole tank of acros can be wiped out within a matter of hours. They are unsure why this happens, but it would probably be a good idea to have all the Acros you are going to want, and put them together at once while they are still young. Live Coral Care Brown, bottlebrush, and thin-branched Acropora are considered the most tolerant of aquarium conditions. Tabletop Acropora are the most difficult to keep in the home aquarium. The staghorn type, like Acropora formosa, are somewhere in between the two. Acropora need to be carefully acclimated to their new homes. They need to be placed in their permanent position within a tank after acclimation. Moving Acropora from place to place will stress them. Acroporas do best in a reef tank of 100 gallons (380 L) or larger, with some fish for organic matter production. Aquariums must be at least a year old, stable, and with very low nitrate levels. Provide high light levels (metal halides are suggested), a temperature range of 72-83 F (22.2 to 28 C), salinity (specific gravity) of 1.023-1.025, and a strong and surge-like water movement. They prefer a strong, random, mixing-type current, therefore a rotating powerhead or wavemaker setup is recommended. Tunze stream pumps, though they have a comparatively high initial purchase price, are popular with Acro keepers. See each individual coral for more information. Acropora Coral Feeding In the wild, Acropora corals have developed several feeding strategies to increase their survival in nutrient-poor waters. Acropora corals have a symbiotic relationship with a marine algae known as zooxanthellae, and they receive the majority of their nutrients from it. With zooxanthellae, many can subsist primarily on little more than sunlight, water, and oxygen. They have other feeding strategies as well, such as capturing planktonic organisms and ingesting microscopic food particles. This feeding is done at night, when the water moves, rising from the floor to the surface carrying particulate matter. They can also absorb dissolved organic matter, and the solitary bladder type corals can consume larger food particles. In captivity, feeding zooplankton once a week is the preferred choice. Copepods, Artemia, and nauplii are too large for them to ingest. But new forms of prey are being developed, such as invert larvae and new strains of rotifers. Many feel that Acros in captivity need to be in a tank that has dissolved or solid organic matter to survive and thrive. Without this, they may seem fine for a while, but over a few months, without any visible indication, they may end up dead because of starvation. Signs of lack of food would be no new growth, polyps extending and some tissue recession. Acropora Coral Reproduction The Acropora Sp. are male and female and can reproduce both sexually and asexually. In the wild they reproduce sexually by releasing eggs and sperm at the same time, resulting in a fertilized egg which then forms into a free-swimming planula larva. Eventually the planula larvae settles onto the substrate, becoming plankters. This then forms a tiny polyp which begins to excrete calcium carbonate and develops into a coral. Planula larvae are extremely vulnerable to predation, and very few survive. In the wild Acros reproduce asexually as well. The polyps at the tips of branching species secrete corallite around itself, forming longer branches. Acros also spread from breakage due to storms and fragmentation. SPS Coral Ailments There are various ailments that small polyp stony (SPS) corals fall victim to. Several ailments are often named for what they look like, such as white plague or yellow-blotch. Sps corals have a particular susceptibility to rapid tissue necrosis (RTD). This is the sloughing off or peeling of the tissue from the skeleton. The causes can be pretty much anything, such as any fluctuation in temperature, salinity, or lighting. RTD is easy to identify, if your coral starts to slough off flesh from the bottom up, it has RTD. One way to help is to frag the coral. Break it well ahead of the deteriorating coral, thus possibly saving the tips or branches. This is done, especially on new corals that have shipping stress as their RTD trigger. To fight black band disease, and prevent necrosis, the corals can be treated with Tetracycline at 10 mg per quart/liter according to one author. Cyanobacteria and brown jelly infections can be treated with Neomycin sulphite, Kanamycin and other broad-spectrum antibiotics. The pill can be pulverized into a fine powder, mixed with sea water to make a paste, and then applied to the wound, or affected site of the coral with a simple artists brush. Bleaching is the mass expulsion of zooxanthellae. Anything can trigger it and it generally will take the aquarist by surprise. The coral is still alive but with slightly pigmented tissue; it will not be pure white. To prevent bleaching if your tank experiences a temperature hike, turn down your lights. This is so the zooxanthellae does not expel out of control. Otherwise once bleaching occurs, it has a 50/50 chance of complete healing. The coral will be prone to illness at this time. Acropora corals tend to produce mucous nets that can be a way to eliminate their waste or capture prey. Unless it looks unhealthily, leave the coral alone. Some mucus of species can harm other corals if it comes in contact with them. Corals For Sale Experience over the last few decades has strongly indicated that captive bred stony corals are much more adaptable and hardy than wild caught specimens. So it is better to acquire captive bred Acropora when possible. You will not only get a more durable coral, but there are often many beautiful color morphs available. Examine at what you buy. Look at their axial corallites or tip area, typically brown polyps result in poor growth rate, and fail to thrive in captivity.